What is Brazilian Green Bee Propolis? Propolis originates from the Latin words "pro" for in favor of and "polis" for city. Put together, it means in favor of the city. Propolis is a sticky, resinous substance collected by honeybees (Apis mellifica L.) from the leaf buds of trees and certain vegetables. Bees gather this and transform it in order to disinfect the beehive, seal cracks, build panels, as well as using it as a microbiocidal agent, disinfectant and also for embalming intruders otherwise difficult to expel due to their size. Propolis, thus, is directly responsible for guaranteeing the asepsis of the beehives, locations prone to developing viruses and bacteria, given their conditions of temperature and humidity. Due to the great number of active ingredients present, Propolis is well known and used for its therapeutic properties, principally for its stimulant action on the organisms' defense system. Notable amongst its properties are its antioxidant and anti-microbial action, its activity as a stimulant and its healing, analgesic, anesthetic and anti-inflammatory activity. Prized for its antiviral, antibacterial, antiseptic and antifungal properties; 100% lab tested and combined with Vitamin E for its natural preservative properties, Brazilian Green Bee Propolis softgel capsules are rich in bioflavonoids, provide antioxidants and nutrients for the maintenance of good health. Why Brazilian Green Bee Propolis? Its impressive antiviral, antibacterial, antiseptic and antifungal properties are some of the main reasons that Propolis has been extensively researched and used as a natural health product dating back to 350 B.C. Brazilian Green Bee Propolis is considered as the world's best and most effective Propolis. This is partially due to the fact that Brazil (the largest Propolis producer in the world) has the proper climate and environment for bees to produce Propolis throughout the year. Bee Propolis is usually sticky at and above room temperature (20 °C), but becomes very hard and brittle at lower temperatures, rendering it difficult to obtain or use in many countries during the winter time; however, the tropical weather condition in Brazil makes it ideal for harvesting Propolis all year long. In addition, the biodiversity of the Brazilian rainforest flora provides a rich and unpolluted natural environment from which the bees could collect Propolis from. While Propolis from other locations (European/North American/Chinese /Argentinean, etc.) is produced using 2 main kinds of plants (Poplars and Birches), the Brazilian Propolis comes from more than 300 different types of plants and greatly contributes to its comprehensive health benefits. 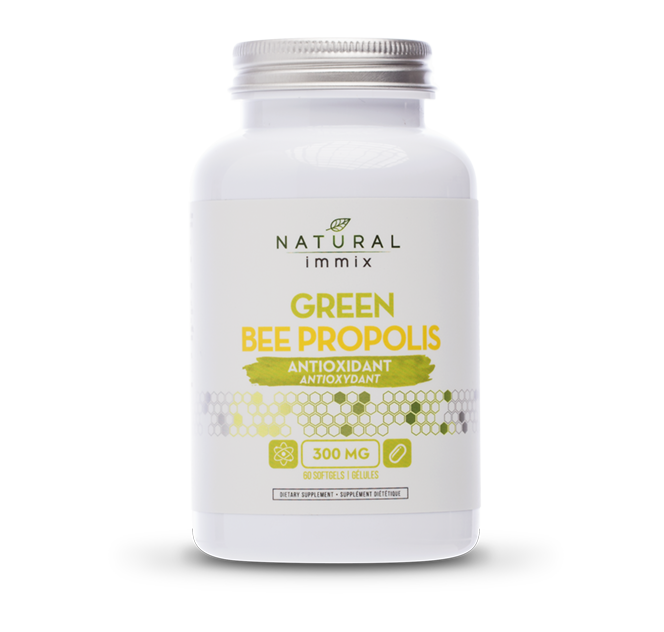 Brazilian Green Bee Propolis is sourced from Brazilian Green Bees, leading to a Bee Propolis supplement with maximum potency for the best effects in an easy-to-take, softgel capsule. Brazilian Green Bee Propolis: is a more potent source of the strongest antibiotic found in nature. Unlike many antibiotics, Brazilian Green bee Propolis is exceedingly safe and does not destroy good, beneficial bacteria along with bad bacteria and has no known side effects, contraindications or upper limits of ingestion. It also does not cause the body to build up a tolerance over time, meaning it can be used regularly without losing effectiveness. Useful for canker sores, sore throats and infections caused by bacteria, viruses, fungus, and single-celled organisms called protozoans, Brazilian Green Bee Propolis also helps boost the immune system and can improve gastrointestinal (GI) problems including Helicobacter pylori infection. Brazilian Green Bee Propolis is an antioxidant and anti-inflammatory agent and it can be applied directly to the skin for wound cleansing, for cold sores, as a mouth rinse for speeding healing following oral surgery, and for treatment of minor burns. Brazilian Green Bee Propolis has also captured the attention of those wanting to enhance their overall, general health because it contains many nutrients such as protein and amino acids, trace minerals - magnesium, calcium, phosphorus and potassium - plus antioxidants such as beta carotene and bioflavoniods, as well as vitamins B1 and B2. Vitamin E: an antioxidant added in small quantities to act as a natural preservative.